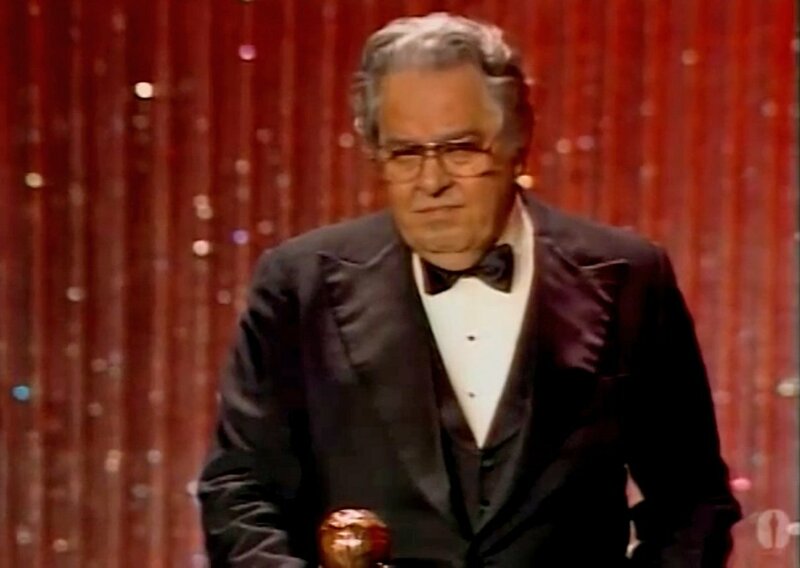 At the 54th Academy Awards® in 1982, Roger Moore presented James Bond series producer Albert R. “Cubby” Broccoli with the Irving G. Thalberg Memorial Award. This award is given to “creative producers, whose bodies of work reflect a consistently high quality of motion picture production”. 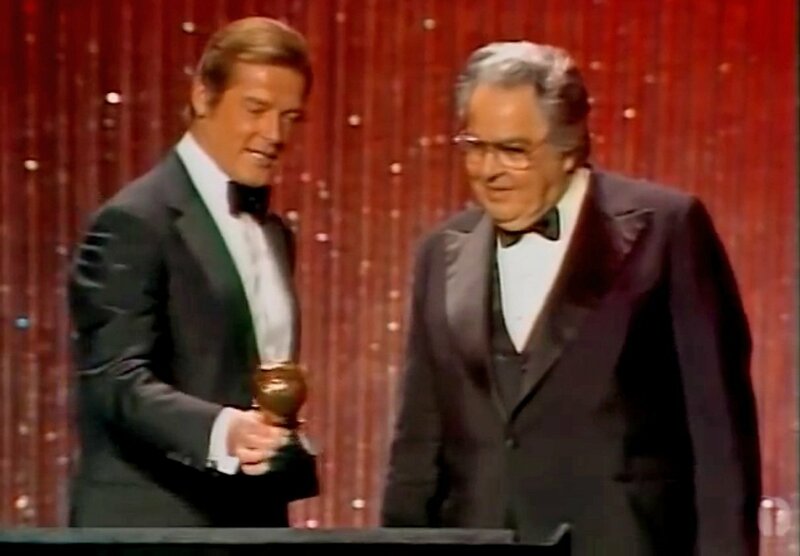 Moore wears his black Douglas Hayward dinner suit from For Your Eyes Only as he presents the award to Broccoli, who is wearing a dinner suit most likely made by Moore’s former tailor Cyril Castle. Broccoli probably went to Castle for a dinner suit at the time Castle was making suits for Moore for the Bond films. Since Castle only worked on Live and Let Die and The Man with the Golden Gun, this dinner suit would have been made between 1972 and 1974. Compared to Moore’s matte wool dinner suit, Broccoli’s dinner suit has a sheen that suggests it is a blend of mohair and wool. Broccoli’s single-button dinner jacket has satin silk-faced peaked lapels, satin silk-covered buttons, double vents and jetted pockets. 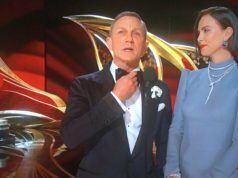 The dinner jacket has many signs that it was made by Castle due to the similarities it shares with Moore’s suit jackets from his first two Bond films. The jacket’s shoulders are softly padded with gently roped sleeve heads. The peaked lapels are wide and cut with no belly, as Castle usually cut his peaked at that time. The cuffs are the same kissing link-button cuffs that Moore wore at the time. The front darts extend through the hip pockets to the bottom of the jacket, just as on the jackets Castle cut for Moore. The jacket has some waist suppression, but the silhouette looks different than Moore’s because of Broccoli’s girthier figure. The back of the jacket needs to be let out, and bespoke suits such as this are typically made with a large seam allowance to accommodate weight gain. Though wide lapels should recall the 1970s, wide peaked lapels on Broccoli help give breadth to his shoulders to balance the lack of a waist. Not much of the dinner suit’s waistcoat can be seen, but it is made in the same cloth as the rest of the dinner suit. Though waistcoats for black tie should be low-cut and thus almost entirely covered by the jacket, this waistcoat is high-cut with four or five satin silk-covered buttons. Whilst it breaks from protocol, this waistcoat has satin silk shawl lapels to show that its maker is still aware of proper evening waistcoats and has purposely chosen to differ from what is traditional. Castle may have thought that a higher-cut waistcoat was more flattering on Broccoli. The dinner suit’s trousers have straight legs and a satin silk stripe down each side. The white dress shirt has a spread collar, pleated front and double cuffs. Two square black onyx studs with a white square in the centre show on the front shirt, and the cufflinks are of a similar design to the studs. Double cuffs have the same shape as the kissing link-button cuffs on the dinner jacket. Though what Broccoli is wearing is not incorrect, Moore’s barrel-fastening cocktail cuffs from his first two Bond films are a better match with these jacket cuffs because the shapes do not compete. Broccoli’s bow tie is a black satin silk butterfly, which matches the material of the lapels. It does not, however, match the width of the wide lapels and helps bring the 1970s dinner suit into the 1980s. A high-resoution image of Broccoli in his dinner suit can be found on a page about the 54th Academy Awards on Oscars.org. Funny how someone with Cubby’s wealth would hang on to the same dinner suit and not update it was 8-10 years. That’s not a very long time to keep a dinner suit for someone who isn’t into the latest fashions. I’m sure Moore wouldn’t have been wearing new dinner jackets all the time if they wasn’t made for his Bond films every two years. Another great article Matt, always interesting to see how tailoring holds up outside the controlled environment of a film studio. On another note, have you thought about improving the navigational features of the website? With the huge amount of articles available now, some of them quite abstract, it’s becoming difficult to find a specific suit or outfit that you’ve covered in the past. Just a thought, not sure how easy it would be to sort something like that. I’ve been working on making changes to the site’s design. True, but he was considerably wealthy but that time. But as you say he wasn’t into the latest fashions and don’t feel the need to keep up with the jones. He wouldn’t have worn a dinner suit as much as a lounge suit or a sports jacket, so he wouldn’t update them as quickly. will you be writing any new articles on ralph fiennes and his tenure as John steed? I think I noticed the word Corneliani, when he is fencing in the tailor shop. Also I currently reside in an Asian country and I am planning on getting a bespoke suit. I’m thinking of going the medium gray flannel suit in the tld. Any words of advice you can give me? I’m not sure yet if I will. Anderson & Sheppard tailored Fiennes for that film, in a much different style than the more appropriate equestrian suits Macnee wore. The best advice I can give is to get a suit that works best for you. It needs to look good on you and fit your needs. A flannel suit is best for a cool place like the UK. The lapels on the jacket are apparently creasing and pulling unevenly at the edges due to the sewn nature of the interlining. I learned from my tailor that it is a side effect of early tailoring and happens to pretty much all non-newly made jackets. My tailor also assures me that the new fused/laminated lined lapels can hold the shape longer relatively. Matt, just wondering if you prefer sewn or fused lapels on your jackets? I prefer lapels with a sewn canvas over fused lapels. Broccoli’s lapels simply need to be pressed. Lapels should never be fused. Fused lapels lay flat and lifeless, and they can bubble, which cannot be fixed by pressing like these lapels can. Looks like the stitching on the lapels has shrunk and is now pulling. Pressing is unlikely to cure this, as the stitching has become shorter than the fabric. Broccoli’s meanness was legendary. A huge factor in Connery’s decision to quite the role was his feeling that both Broccoli and Saltzman were short changing him (although Connery himself is equally parsimonious). Moore would joke about his haggling with Broccoli for his fee for every movie after Moonraker. I cannot imagine Moore, Brosnan or Craig not changing their evening suits at regular intervals whether these were “nicked” from a movie or bought themselves. Like Broccoli money wouldn’t be an issue. Incidentally, it doesn’t flatter Broccoli at all anyway. What interests me about this article is how representative it is of a bygone era of Hollywood, when people wore their own classic tailoring to the Academy Awards rather than being dressed by a team of designers and stylists as they are today. Thanks for the post, Matt. The Thalberg was well-deserved recognition for Broccoli – it is tough to put up big budget excellence year-after-year, and if the quality of the films varied, the production values were always high. It is nice to see a wealthy man in a rumpled, well-worn, sightly ill-fitting and dated tuxedo. Kyle – good point; today, he would be given a free tuxedo by a big-name designer. David – everything I have read about Broccoli is that he was a great producer, very generous, and most got on with him just fine. Connery (and Moore) argued over money because, in a classic producer’s view, they were employees or, in Hitchcock’s view, “cattle.” But Moore hasn’t had anything negative to say about Broccoli outside the realm of contract negotiations that I am aware of. Connery – well, he had his well-documented issues with the Bond producers (and just about every producer he ever worked with). Thank you for yet another excellent and informative article. I remember that evening very well. I was the ABC-TV staff member assigned to “look after” both Mr Broccoli and Mr Moore that evening (and the two days of rehearsals preceding the Academy Awards live broadcast). What I recall most is that both gentlemen were very gracious and enjoying every moment during those three days, with Mr Moore especially being in exceptionally high and jovial spirits. He even brought his son Geoffrey along to the rehearsals (whom I found to be a well-mannered and very mature conversationalist, who had a great rapport with his father). 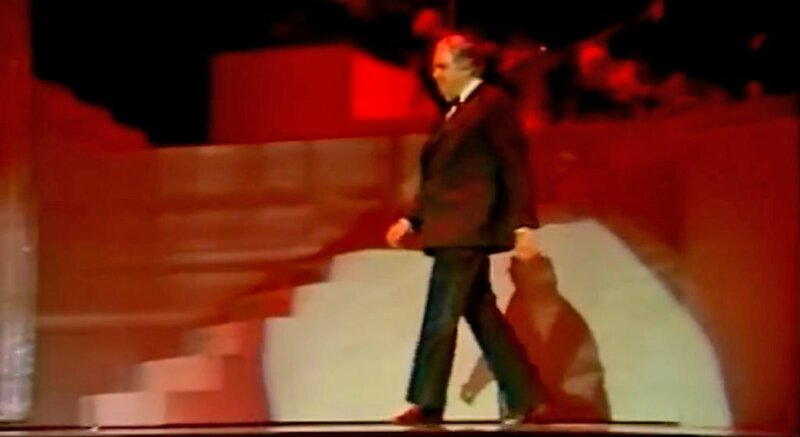 By the way, the set appearing behind Mr Broccoli had just been used in a very elaborate James Bond-themed musical production number featuring Sheena Easton singing “For Your Eyes Only”.